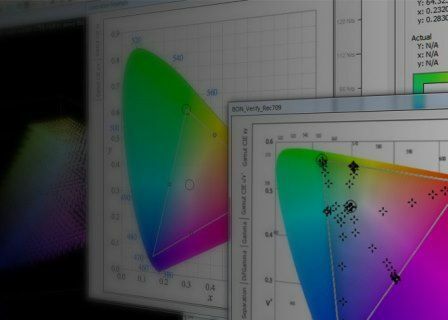 LightSpace CMS can be used for manual Display Calibration, using any display's in-built Colour Management System (CMS) controls to accurately calibrate the display as far as is possible with the display's provided controls, such as brightness, contrast, gamma, bias & gain, saturation, etc. Uniquely, manual display calibration can be performed with the Free LightSpace DPS version of LightSpace CMS. LightSpace HTL provides home cinema calibrators with exactly the same tools, capabilities and accuracy as the professional LightSpace CMS versions, guaranteeing images seen on a home cinema system will match perfectly the look intended by the film's DoP and Director. LightSpace CMS is the most capable and feature rich display calibration, LUT management and colour management systems (CMS) within the industry, offering a wide range of tools and capabilities to enable the generation of accurate 3D LUTs for post-production, broadcast and on-set operation, enabling highly accurate display device calibration and look emulation. LightSpace CMS is the de-facto standard for advanced colour management within the global film, TV, and post-production industries where colour control is critical. LightSpace HTL brings such colour critical control the the Home Cinema market. Calibration without compromise for the home user, guaranteeing the most accurate results possible, for those not looking to use expensive probes. LightSpace HTL is not a limited or cut-down version, and instead is exactly the same as used within the professional market for high-end colour management - no compromises. This makes LightSpace HTL the best possible calibration system for use in any home environment. Knowing you are using the exact same system as used in professional post-production facilities, where the master film and TV programs are graded, guarantees the images seen will match perfectly the look intended by the film's DoP and Director. LightSpace HTL makes the professional calibration of home displays exceptionally fast and easy, without the need for pre-set and limited workflows, or extensive knowledge of colour theory. LightSpace HTP provides home cinema calibrators with exactly the same tools, capabilities and accuracy as the professional LightSpace CMS versions, guaranteeing images seen on a home cinema system will match perfectly the look intended by the film's DoP and Director. LightSpace CMS is the de-facto standard for advanced colour management within the global film, TV, and post-production industries where colour control is critical. LightSpace HTP brings such colour critical control the the Home Cinema market. Calibration without compromise for the home user, guaranteeing the most accurate results possible. LightSpace HTP is not a limited or cut-down version, and instead is exactly the same as used within the professional market for high-end colour management - no compromises. This makes LightSpace HTP the best possible calibration system for use in any home environment. Knowing you are using the exact same system as used in professional post-production facilities, where the master film and TV programs are graded, guarantees the images seen will match perfectly the look intended by the film's DoP and Director. LightSpace HTP makes the professional calibration of home displays exceptionally fast and easy, without the need for pre-set and limited workflows, or extensive knowledge of colour theory.